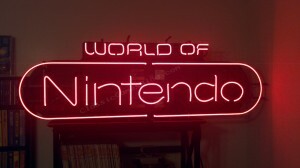 Nintendo neon signs such as “World of Nintendo” signs. I found this in a pawn shop recently while looking for NES games. 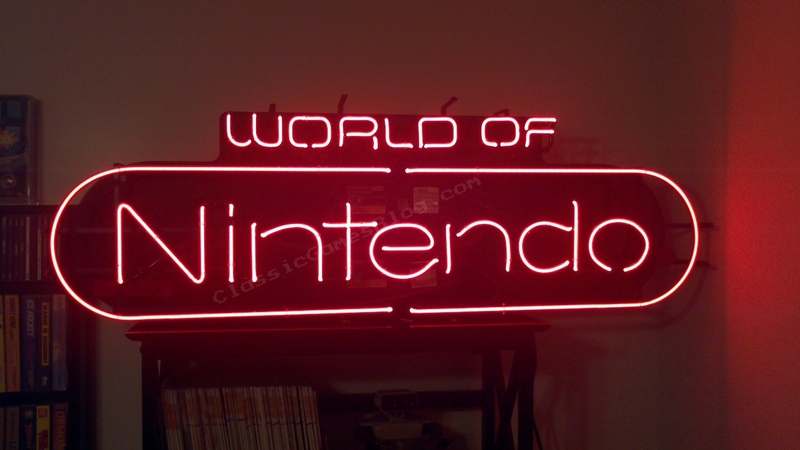 It was broken in two places and the only part that would light up was the word “Nintendo”. As soon as I saw it I knew I wanted it. I asked if it was for sale and was told “No, it’s for display purposes and it’s not for sale”. I was pretty discouraged and disappointed. Since this pawn shop is one that I frequent when searching for retro games I ended up stopping in there a month later and figured I would ask again. This time I was told “Yes, we can sell it to you but it’s partially broken”. Needless to say I purchased it and now my mission was to get it fixed. I found a local neon shop that fixed the broken neon tubes and recharged it with the gas. I haven’t seen too many of these online and I’m not sure how much it’s worth but I plan on keeping it for a long time.